Ideal to Monitor Your Employees From a Centralized PC Anywhere on the Network. NetVizor centralized employee monitoring is the award winning network monitoring and supervision solution that your network needs! NetVizor gives you the power to log all keystrokes, emails sent/received, websites visited, windows viewed, applications ran, internet connections made, passwords entered, chat conversations that were made, and even capture screenshots of the user's activities! NetVizor allows you to centrally monitor employees and control machines on your network from one location. Remote real time supervisor administration, monitoring, reporting, and tracking of users on a network has never been easier! NetVizor allows a supervisor to quickly, and easily view what is happening in real time on your entire network with a single click from one centralized location. A supervisor's connection to each specific workstation just to see what the remote users are working on is no longer necessary. View an auto-refreshing list of all the computers on your network detailing who is logged in to each computer at that moment, and view what window they have open and are using at that time, as well as take-over the desktop of the computer. NetVizor centralized supervisor monitoring software can launch a visual network overview that shows you thumbnail screenshots representing each computer on your network at that moment. Each thumbnail links to a full size image of the remote computer's desktop. Launch remote control sessions with computers on your network. NetVizor allows you to take control of an employee's mouse and keyboard that has NetVizor installed from a supervisor's PC on the network..
NetVizor centralized supervisor monitoring software logging capabilities are unmatched. NetVizor employee monitoring can log anything from what the user types, to emails sent/received and programs they ran - all time stamped by date for easy viewing. All logs are easily saved and exported for later use. All of NetVizor's logs can be remotely viewed from a central location for easy activity management! View what users are typing in real time as they type! NetVizor's real time keystroke viewer will show every keystroke an employee types, as they type it, and categorize each keystroke under the window they type it in. Monitor and log all emails sent and received by employees on any computer! All SMTP and POP3 messages are recorded for later viewing from a centralized supervisor location. Log how long employees are active, and inactive during each computer session. Logs include when each employee session started, and when it ended. Log all events users performed and view them in an organized chronically ordered listing. The Events Timeline lets you view what the events the employee performed, in the order they did them. Events logged include Program Starts/Stops, Website Visits, Document Viewings and Printings, how long employees were active and idle each session, and more. Monitor and log all applications ran by employees - NetVizor centralized supervisor monitoring can log when the application was started, stopped, and how long it was actually used. NetVizor also logs how long users were actually using each program. Log all websites visited by the popular browsers used today. All website visits are logged by website address, employee username, and duration of the site visit. NetVizor also logs how long users visit each website so you can easily see what websites are visited the longest. NetVizor centralized supervisor monitoring supports the latest versions of the following browsers: Internet Explorer, Netscape, Opera, Mozilla, Firefox, Flock, Google Chrome, and America Online. Log webmail messages from most major webmail providers - such as Gmail, Yahoo Mail, and MySpace webmail. NetVizor centralized supervisor monitoring logs incoming messages read by the employee, as well as messages they send out through webmail. All website content visited can be logged as well. NetVizor centralized supervisor monitoring of employees can monitor and log all internet traffic data that is sent and received by your computer. This data includes emails, website requests and contents, FTP sessions, passwords, chat conversations, and more. Record documents and files opened and viewed by employees. Record documents and files that are printed by employees. Log all file system activity. All file modifications, creations, and deletions are logged by the time of the event, and the employee who executed them. NetVizor centralized supervisor monitoring can take snapshots of your desktop at set intervals of time, allowing you to visually see what is happening. The ScreenShot capture manager also has a built in slide show viewer for easy viewing. Log all windows in which the employee directly interacts on the desktop. Record software installations performed by employeess - software name, installation path, and time of installation is logged. Grab screenshots of the remote computer's desktop - allowing you to see what your employees are doing on your PC in real time from one centralized supervisor location! Log all all system shutdowns and employee log-ons, as well as NetVizor actions: starting/stopping of monitoring processes, option changes, log accesses, and failed access attempts to start/stop monitoring. NetVizor centralized supervisor monitoring can view a list of the current internet connections on the remote machine! View a list of the recent documents employees have opened! NetVizor allows you to remotely view what the employee is doing in real time - what windows are open, what applications are running, and more from a supervisor centralized location! Remotely monitor off-network computers by having recorded activity logs (excluding chat and email logs) emailed to your email address. Guaranteed log delivery available when combined with our Stealth Email Service! NetVizor has built in remote employee supervison features that allow the supervisor to remotely control remote workstations. NetVizor allows for remote workstation security auditing, remote application and windows management, file system browsing, system lockdowns, and more! Perform a security audit on network workstations - NetVizor centralized supervisor monitoring can audit the remote workstations password and user policies, as well as improper registry settings, file shares, and trojan/virus infections. Registry audits can be fixed remotely as well via the NetVizor web interface. Browse and navigate the entire file system of the remote PC. The NetVizor centralized supervisor monitoring remote file system browsing feature allows you to download, delete, and launch remote files - all through your web-browser! Lock and unlock the remote desktop from your web-browser! This allows you to keep users out of the remote PC, without ever having to be present at the PC! View all open windows on the remote PC's desktop. Close the open windows with a single click! Now you can control what Windows the remote employee can see! Launch a website or program on the remote PC for the remote employee to use all from one centralized location! The supervisor can display a message for the remote employee to read. This allows a supervisor to send warnings, or simple messages to the remote PC! Shutdown, Restart, or Logoff the remote PC from your web-browser with NetVizor centralized supervisor monitoring! NetVizor centralized supervisor monitoring not only acts as a powerful network monitoring and spy software solution, but also as a content filtering and activity alerting tool. NetVizor employee monitoring can filter websites from being visited, applications from being ran by the user, and even chat messengers from being used while NetVizor is active. Alerts allow you to respond instantly to unwanted behavior. NetVizor allows you to control what programs employees cannot run. NetVizor centralized supervisor monitoring allows you to control what websites employees can and cannot visit. NetVizor allows you to control what chat messengers employees can and cannot use while NetVizor is running! NetVizor has the ability to instantly block portable and external drives that may be used by employees to steal data off of your network. NetVizor centralized supervisor monitoring can be configured to send you alert notifications in real time when an employee performs an unwanted behavior. Alerts can be displayed in NetVizor's centralized alerts manager as they occur, and/or you can receive alerts via email. NetVizor can log just about every move an employee makes - generating massive amounts of user activity information - so essential log management and reporting features are a must. To make log viewing and management a simple task, NetVizor centralized supervisor monitoring has built-in Top 10 report generators, summary reports, log cross-referencing, filtering, and search features. NetVizor's extensive and flexible report generation capabilities can create complete network-wide top 10 activity usage reports, network activity overview reports, trend analysis reports, and individual reports for each activity log. Reports can present activities on a network-wide scale, or for individual computers. NetVizor's centralized supervisor monitoring has built-in cross-referencing features can link together relevant log data for easy and efficient log browsing with just a few clicks. Quickly search a single employee's logs, or all computer logs on your network for specific keywords that may be contained in NetVizor's logs. 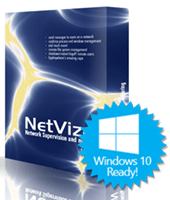 NetVizor centralized supervisor monitoring software has a large array of security and stealth features. NetVizor is undetectable under all Windows versions (it does not even show up in the task manager on any Windows platform) and can circumvent popular third-party "spyware" detectors. NetVizor has powerful lockdown and logging scheduling features, optional startup warnings, and much more that will make a supervisor job much easier. NetVizor can run totally in stealth; that is, it is virtually undetectable to the employee. NetVizor will NOT show up in the task manager under Windows - at all. NetVizor does not appear in registry and Windows startup utilities while it is running, either. NetVizor centralized supervisor monitoring has a built in encryption option that allows you to have all your NetVizor activity logs encrypted so others cannot stumble across NetVizor's logs or read them without using NetVizor's protected log viewers. NetVizor is password protected to prevent easy monitoring termination and option changes. Run NetVizor already in active centralized monitoring mode. NetVizor centralized supervisor monitoring allows you to configure what remote options you can access through your web-browser. You can disable any features of your choosing! NetVizor has always been known as being extremely easy to use by a supervisor. You can have NetVizor setup and monitoring in seconds with its built in easy configuration wizard and intuitive graphical interface. NetVizor can even be tweaked to smoothly monitor slower PC's! Network supervisors can configure and deploy NetVizor invisibly over their entire network with just a few clicks, or remove it just as easily - from one central location! Network centralized supervisor monitoring deployment can be completed in just a few moments.